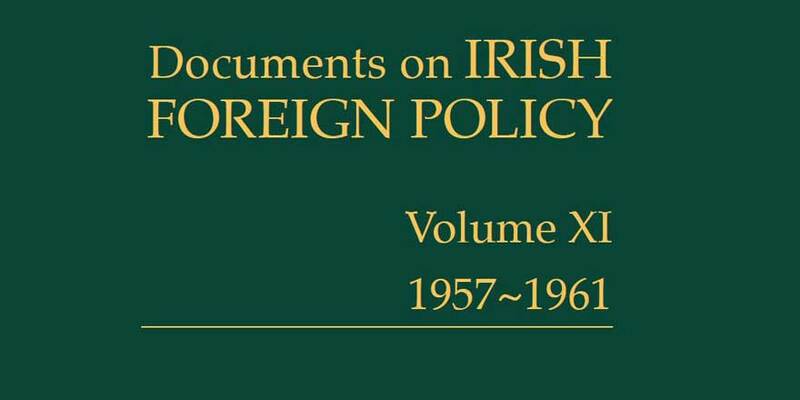 Documents on Irish Foreign Policy Vol. XI, was launched last November and garnered a good deal of media attention at the time. On Sunday 24 March, the latest DIFP volume will be the subject of a special edition of Bowman on RTÉ Radio One, with Executive Editor Michael Kennedy in conversation with John Bowman. DIFP XI covers the period 1957-61 (the height of the Cold War), and the programme also featured archival recordings of many of those who appear in the volume: Frank Aiken, Conor Cruise O'Brien, Sean Lemass, John F. Kennedy, and others. Listen back to the full episode here. Michael also appeared on a recent edition of RTÉ's Nationwide, discussing the 'Éire' signs constructed around the Irish coast during the Second World War, one of which has recently been uncovered and restored by a community project in Dalkey; watch the episode in question on RTÉ Player here.